In recent years, the Dire wolf – or the idea of a “Dire” wolf – has become fairly popular. It’s not just the Grateful Dead song. It’s part of popular culture in Game of Thrones. The dread, cunning, rapacious, vicious, enormous Dire Wolf. 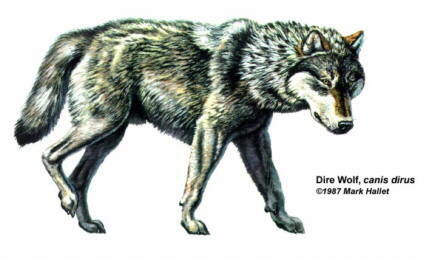 The Dire wolf was North America’s own. Scientists think that it, unlike the gray wolf, evolved on this continent. And what a wolf it was. It was big, weighing up to 175 lbs. And strong – very strong. Its jaw was larger than that of modern wolves, and it teeth were bigger, and its bite was stronger. It was well designed for hunting and killing and then eating large prey. Its scientific name, canis dirus incorporates the word – dire. From the Latin meaning “fearful” or “awful.” Nice. Like modern wolves it was able to adapt to all kinds of environments. Its remains have been found throughout the country, and into South America as well. It lived in all sorts of habitats – forests, mountains, open grasslands and plains; from sea level to over a mile high. And it was very common. Over 3,600 of them have been pulled from the La Brea tar pits in Los Angeles. The Dire Wolf was carnivorous. Scientific analysis shows that its diet favored bison and horses, although it ate mammoths, sloths, and other large prey, if it could catch them. It was heavily built, and while only slightly larger than modern gray wolves, it weighed probably 25% more. And, as noted above its skull contained adaptations that suited it for hunting large, heavy prey – its skull was broader than that of modern wolves, and had attachments suggesting that the muscles which drove its jaw were exceptionally powerful. So far, only bones have been found. We don’t know what its fur looked like, but everyone sort of assumes that it looked like modern wolves. So how did it compare to modern wolves? Well, as noted above, its skull was bigger, heavier and stronger – more suited to hunting and grabbing onto large prey animals. But its braincase was smaller. I’m not sure that intelligence had to do with anything in this context, though. Both dire wolves and gray were very successful for tens of thousands of years, so while a gray wolf might score higher on an IQ test than a dire wolf, it doesn’t seem to have made any actual practical difference. Its legs were shorter and stockier than modern wolves, suggesting that it wasn’t as fast, and not as well suited to the long effortless loping that wolves do. These anatomical differences, combined with the fact that the dire wolf evolved in North America, while the gray wolf evolved in Eurasia, raise questions about how the dire wolf lived. Modern wolves are pack hunters – Was the dire wolf? There is no evidence of sexual dimorphism – the females were the same size as the males, so presumably they engaged in the same behaviors. But was this the active pursuit of, say, a bison? Or were they more like hyenas, and scavengers, first, and hunters only secondarily? Skeletal evidence shows several things that shed some light on its behavior. First many of these animals survived broken bones. This implies that perhaps the pack brought food to injured members. And it suggests that there was some level of pack behavior. This is supported by scarring on some of the skulls consistent with hierarchical behavior – dominant wolves grabbing and biting the heads and faces of subordinate animals. Finally, the dearth of wolf puppy bones found at La Brea also supports the idea that these were packs animals. They probably left the puppies back at the den while the pack was hunting, and then brought food back to the puppies. But while it is reasonable to suppose that they were pack animals, the size of a typical pack is unknown. Were they small, family-based packs like coyotes, (to whom they are closely related)? Or did they run in larger, bigger packs, better suited to hunting and bringing down large prey? The gray wolf came over, across the Bering Strait land bridge, from Eurasia, approximately three hundred thousand years ago, and found the dire wolf already here. And they coexisted for hundreds of thousands of years. Presumably, then they filled different ecological niches. The gray wolf was, it is thought, faster, more fleet of foot, and probably able to run for a longer time than the stouter, stockier dire wolf. The dire wolf, in turn had a skull better equipped for taking large heavy prey. So, presumably, the gray wolf hunted smaller faster animals – deer, or elk – while the dire wolf was taking horses and bison. Or, as some believe, perhaps the dire wolves scavenged. 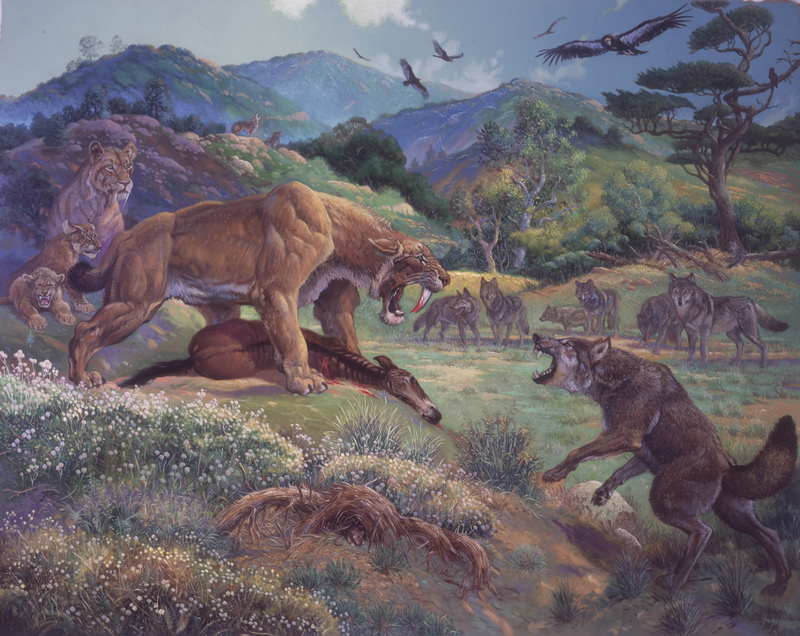 That would have been quite a sight – a Smilodon, having taken down a camel, or horse, looks up, and sees fifteen or twenty wolves coming in, focused, intent, snarling, ready to take the kill. As with so many other large animals, the Dire wolf went extinct some ten to twelve thousand years ago. But the gray wolf did not. This is a real mystery. Why the one, and not the other? There are several theories. One is that the dire wolf was so adapted to large prey that when the megafauna went extinct, it did too, while the gray wolf was more adapted to smaller prey which survived. Some have speculated that the dire wolf didn’t so much coexist with the gray wolf as compete with it, and the gray wolf finally won. Another theory is that the dire wolf became extinct in the face of a new competitor – human beings. But there are problems with each of these theories – over-specialization; competition with gray wolves, pressure from humans. 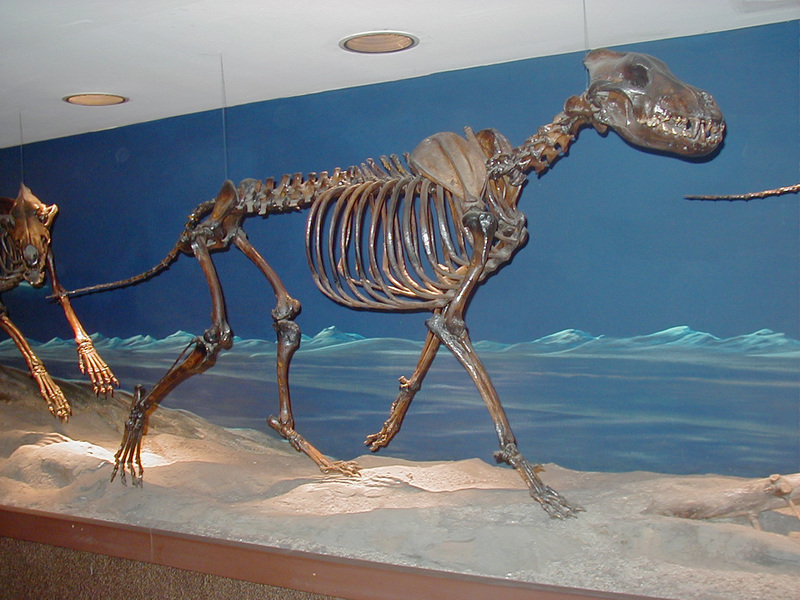 First, dire wolves were, according to the fossil remains, very common. And spread throughout the continent. As were gray wolves. If it was pressure from humans, then why would dire wolves become extinct and gray wolves survive? Dietary analysis shows that dire wolves’ diet differed from that of gray wolves – so they weren’t directly competitors. Although, once the large slow animals were gone, the gray wolf would probably out-competed the dire wolf for hunting the smaller fast prey – deer and elk – that remained. But – and it’s a real question – the bison remained. So why didn’t the dire wolf continue as it had, hunting the buffalo, and thriving? I think it is reasonable to posit this theory: The dire wolves were primarily scavengers, although certainly capable of hunting when necessary. Remember that this was all completely wild country. In historic times mountain men and other early explorers of the west reported that hundreds and hundreds of buffalo would be killed trying to cross a river (much as still happens in some part of Africa, today, with wildebeest). So, at times, at least, there would have been ample food for the wolves to scavenge: hundreds of horses, or some mammoths, say, killed trying to cross a river. And if they roamed in large packs, they were formidable, certainly able to drive a pack of lions from a kill (again, analogous to hyena-lion interactions in Africa, today). But they were, therefore, specialists. Not generalists, like the gray wolf. The gray wolf will hunt and eat deer and elk, but also – mice. Anything it can get. And perhaps, notwithstanding what I wrote up above, maybe intelligence does play a role, here; letting the gray wolf see and understand and seize new possibilities, that the dire wolf didn’t. Then, when whatever happened to wipe out so many of the large prey animals, the dire wolf was ill-suited to adapt. The answer is elusive and, as yet, unknown. Each species in an ecosystem is filling a niche so sensitively, and the entire system is so finely tuned, that any little change may throw it out of balance. In the case of the dire wolf, it may be that there was no single overwhelming explanation for their extinction, but a combination of small factors, which, taken together, pushed it out of its niche, and into extinction. So, the horse, which has made up a substantial part of its diet, goes extinct. The pressure on the dire wolves goes up. Human hunters replace lions and Smilodon, and unlike them, can’t be driven from the kill – and the pressure goes up. And the humans make more efficient use of the animals they’ve hunted, leaving less for the wolves to scavenge. And the pressure rises. Not so much a single extinction event, perhaps, but something more akin to the death of a thousand cuts. But even though the actual wolf is gone, the DIRE WOLF lives on in song and story. And for now, that will have to do. Craniofacial morphology and feeding behavior in Canis dirus, the extinct Pleistocene dire wolf, W. Anyonge, A. Baker, http://onlinelibrary.wiley.com/doi/10.1111/j.1469-7998.2006.00043.x/abstract;jsessionid=69EBE865899AA29760D72BCFF14A3E3E.f02t02 (only the abstract is available online). http://onlinelibrary.wiley.com/doi/10.1111/j.1469-7998.2006.00043.x/abstract;jsessionid=69EBE865899AA29760D72BCFF14A3E3E.f02t02 (only the abstract is available online). Not six hundred pounds. Not even close. Sorry, Jerry. Sorry, Deadheads.